A mosaic depicting some of history's most iconic heroes was unearthed by archaeologists in Great Britain. The 1,600-year-old mosaic was found inside the ruins of a Roman villa that depicts the Greek gods Hercules, Cupid and mythological hero Bellerophon, who was known as the greatest hero before Hercules came along. "Volunteers hard at work on the potential site of a Roman barn." "Matt Nichol working on the mosaic"
"Left to Right: Potentially Hercules fighting the Centaur & Cupid with a wreath in his left hand"
"A site tour during the open day (Saturday 25th August)​​​​"
"The mosaic after cleaning, note the Victorian land drain in the corner, and the manner in which the building has been terraced into the slope"
Excavators from Cotswold Archaeology, alongside Boxford History Project and the Berkshire Archeology Research Group, made the discovery. It was found in the West Berkshire village of Boxford. 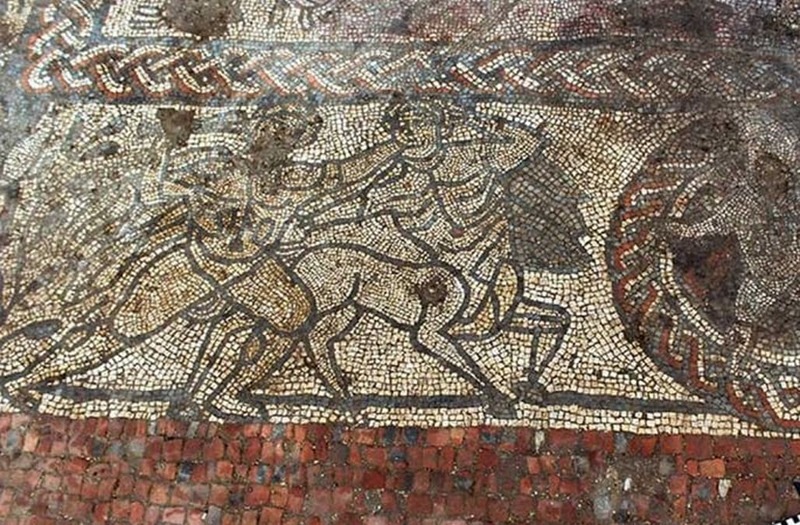 They also found a large villa with a bath house in 2015, as well as the remains of a farm in 2016, but the recent mosaic discovery was very unexpected. Roman expert Neil Holbrook said that whoever's home it was, they wanted “...to project an image of themselves as a cultivated person of taste – someone familiar with classical mythology and high Roman culture,” according to a report in Cotsworld Archaeology.